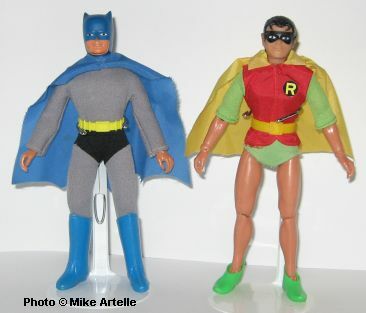 Mego Batman and Robin 8 inch dolls from my childhood. Here's a news flash! Believe it or not playing with dolls does not make a child gay, nor does it "prove" that a child is gay! The Mego superhero dolls shown above were extremely popular in the 1970's, so much so that they were manufactured for a full decade, from 1972 to 1981. As such, almost every kid in my school played with these dolls, not just the kids who were gay. In fact, boys have been playing with these types of dolls since the 1960's and the toys are still very popular today, mostly among adult collectors who had them during their childhood. Therefore you really can't give gay kids from the 60's or 70's, like me, all the credit for supporting this multi-million dollar industry of "boys dolls" for the past 50 plus years. Yet, even today in 2017 there is still a stigma about calling these toys "dolls" rather than the preferred term "action figures", as apparently the latter is more macho. It also allows folks to be in denial about the reality that the toy they like so much is in fact a doll. This desire to hide the truth is evidence enough that there is still a strong and false perception that "Boys shouldn't play with dolls", as it is considered in some way an indication of their masculinity and heterosexuality. Such thinking is a ridiculous and outdated concept, not unlike "A woman's place is in the kitchen". My buff little Robin doll showing off his hot little chest! while showing off his bare legs, which certainly makes this one gay little doll! No wonder Robin was my favourite! The fact is, I would have been gay regardless of what types of toys I played with. Even at such a young age as six or seven I had an awareness of liking the male figure and a specific interest in boys. 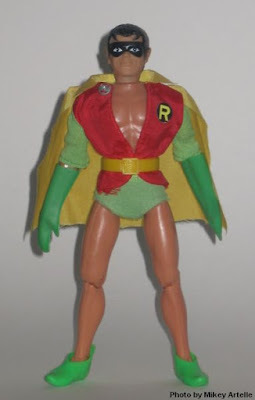 So in regards to my dolls, when I was in grade one I recall being very interested in the sculpted muscular chest on my Robin Mego doll (above), and liked how his shirt opened at the front to show him off. But my Robin doll didn't "make me gay" because I already was gay, even before my parents had bought the doll for me! And I was a selective gay kid, as I clearly preferred playing with Robin over Batman. Heck, at least my Robin doll permitted me to enjoy an innocent expression of my gayness as a child before the weight of the world would come crashing in on me as a gay teenager! 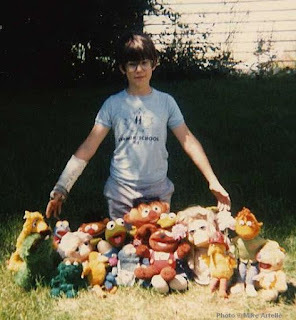 With my Muppet collection in the mid 1980's when I was about 10 years old. I also remember as a kid, drawing a picture of the Incredible Hulk and thinking about how much fun it was to draw his pecks and muscles. Then in grade two, I remember being very interested in a boy in my glass. He had blond hair and for some odd reason one day he took his shirt off in class to reveal a white sleeveless undershirt. The teacher scolded him and told him to put his shirt back on right away, and I recall being quite fascinated while watching him. As far as I'm concerned, memories such as these are evidence enough to demonstrate that my gayness is indeed natural... aside from the other more obvious indications during my teens! So no, playing with dolls does not make kids gay, just as playing with dolls will not make kids heterosexual. The only thing that playing with dolls might cause in children is happiness. Isn't that remarkable!